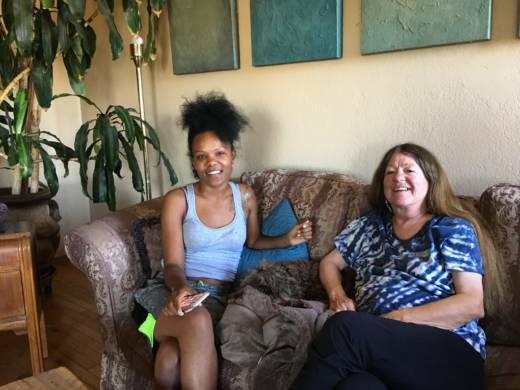 Teryl Burt is 65, and sometimes lives alone in a three-bedroom townhouse in El Cerrito. The once empty rooms in her home now help house homeless guests for months at a time through a tiny non-profit in Richmond. Safe Time works by matching up hosts who have an extra bedroom to share with homeless in need. The guests aren’t necessarily living on the streets, but they are homeless. To qualify, they can’t have any criminal history or drug issues. Nikkii Creer and her five-year-old son Demareau moved into Burt’s home over the summer. The day Creer moved in, Burt started a diary. Creer is 27, but she is still finding her way after years in foster care. She only has a high school degree, and finding work has been tough. And then, she became a single mom. “He just wants to play all the time," says Creer. "We’ve been to the Marina a lot since we’ve been here." The Berkeley Marina is close to El Cerrito, which is great because Demareau loves animals. “He saw a stingray today,” Creer says. “Washed up on the sea!" Demareau exclaims. "The water washed him on the rocks." Like many, Burt has watched homelessness explode in the Bay Area. Today, there are roughly 28,000 people without a home in the nine-county area. Burt felt helpless. But when she heard about Safe Time, she realized she could do something else, besides giving money. “When this program came along, it just seemed like a good fit for me,” Burt says. Burt found out about Safe Time from her friend Chuck Grant in nearby Kensington. Grant started Safe Time a few months ago. He was retired and reading about homelessness. So far, the program has made 10 matches. "We thought there may be a significant number of people who would take folks into their homes for karma points,” Grant says. Burt grew up in small-town Illinois, and her parents would take in acquaintances who needed a place to stay. But even with that example, Teryl needed something like Safe Time to make the experience feel more...safe. Safe Time, however, is loose on guidelines for how hosts and guests should negotiate the new living arrangements. It’s up to Burt and Creer to figure out how to live together. Advocates who have worked with the homeless for a long time are watching this small experiment. A room helps, but people who are homeless also need services, jobs, health care, and sometimes childcare, too. Creer spent her summer trying to organize the next steps after Safe Time: finding a place to live, and a job. She went to Seattle to check out a job, but couldn’t find anywhere to live. She and Demareau spent a lot of weekends in Sacramento crashing with relatives, and looking for apartments. She also looked for apartments in the East Bay. When Burt finally catches up with Creer, they’ve scarcely seen each other for weeks. Sitting around the kitchen table, Creer mentions she’s thinking of moving out of Burt’s house that day. “It’s just costing me a lot more money to come back and forth from Sacramento to Richmond,” Creer says. That’s a huge surprise to Burt. It’s only been one month. That afternoon, while out running errands, Burt is still confused. Burt had a lot of questions. If Creer was spending so much time in Sacramento with family, did she really need housing? And what exactly was she, Burt, supposed to be? A landlord or a friend? And the real frustration: why didn’t Creer think things through? Sometimes, Creer’s decisions didn’t make any sense to Burt. Cutler, with the Homeless Coalition, says Burt’s reaction is understandable. Cutler says Creer’s behavior might make more sense if Safe Time helped hosts understand the realities of homelessness. That night, after Burt got back from running errands, Creer began packing. A few days later, Creer and her son moved out. They eventually found an apartment they could afford in Sacramento, but Creer is still searching for a job. Since then, Burt has hosted three more people. And she’s encouraged her friends to try it. “We can’t solve homelessness overnight," Burt says. "We can only take baby steps to get there." Burt doesn’t have any guests right now, but she’s told Safe Time she’s ready to do it again soon. This story originally aired on KALW.